I loved my two years at Wheeling. My years at Prospect High School were dreary. Over the summer, before starting at Wheeling, I realized that No One knew that I wasn't cool. I decided that I was and started my junior year with enthusiasm. Even better, my boyfriend still went to Prospect, so I was free of the romantic drama thing. The school was new and I was knew--a great combination. Ann O'Donnell Travis has a birthday today. Ann O'Donnell Travis posted a message. Ann O'Donnell Travis has a birthday today. New comment added. Ann O'Donnell Travis added a comment on her Profile. 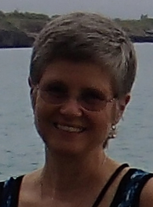 Ann O'Donnell Travis updated her profile. View. Ann O'Donnell Travis added a photo to her profile gallery. I'm so happy at my oldest son's wedding in Hawaii in 2012. Wonderful girl. The best daughter-in-law imaginable. We canceled Christmas and just took whole family to Hawaii. A couple of years ago at Comicon with Rich and my daughter, Eliza. Ann O'Donnell Travis added a photo to her profile gallery. New comment added. My table was a fun group. Three of us teachers on the last day of school. We retired! Dragonfly temporary tattoo at family reunion in Golden Colorado with my two brothers and sister and almost all the cousins. It's so great that several of the Bluett's Fairview Gardens will be at the reunion!